Big Bear Lake is located in the San Bernardino Mountains and is an easy drive from most areas in southern California. It is about 93 miles northeast of Los Angeles, an approximate 2 hour, 10 drive depending on traffic and road conditions. From Beverly Hills it is approximately a 2 hour, 20 min. drive and from the City of San Bernardino (29 miles) - depending on traffic it is a 40 to 45 minute drive. There are three roads that lead in and out of the Big Bear Valley. From the I10 you can choose between the Hwy330 which turns into Hwy18 (called the front way) through Running Springs, or the Hwy38 through Mentone. From the 210 Freeway you can also choose the Hwy330 which takes you directly up the mountain or you can proceed towards Redlands and take Hwy38 if you prefer that route. Hwy38 usually has less traffic, but Hwy330 is quicker. Some people prefer to take the back road which is Hwy18 through Hesperia and Lucerne. All the roads leading to Big Bear offer some pretty spectacular vistas, especially Hwy330/Hwy18 - there are numerous turn-outs where you can stop to enjoy the different views, on a clear day you can see all the way to the ocean; other views are layers of mountains which look like a background from a Da Vinci painting. On the way to Big Bear you will pass through the town of Running Springs, and then Deer Lick. Shortly after that you will pass by the Snow Valley Ski and Snowboard Resort. Approximately 11 miles later you will arrive at the Big Bear Lake Dam, here you will continue going straight over the new bridge and follow the road into the town of Big Bear Lake. If you are staying in Fawnskin you will turn left at the Dam. When travelling to the mountains in the Winter months, you are required to carry chains and its a good idea to keep a flashlight, water, snacks and a blanket in the car - just in case there is a traffic delay due to a storm. The Big Bear Lake area ranges in altitude from 6,750 feet to 9,000 feet above sea level and has an alpine tundra climate. Unlike the flatlands below, this unique area has four distinct seasons, Spring, Summer, Fall and Winter. Village Drive in Big Bear Lake. The average temperature ranges from a pleasant 70 degrees to 88 degrees during the day, and a cool 45 to 60 degrees at night. It is one of the sunniest places in the world, and a typical summer day is clear with blue skies, barring an occasional thundershower. Remember when it is cloudy and hazy down below, on top of the mountain, Big Bear Lake is usually enjoying beautiful, clear blue skies. The average winter temperatures range is from 20 to 64 degrees during the day and 10 to 39 degrees at night. During the middle of the day in the winter you may see skiers and boarders wearing only a T-shirt because if the sun is shining you don't feel cold, but when the sun goes down the temperature drops. Forty degrees is a good temperature for skiing. When winter storms blanket the area with snow, every view is a picture postcard. To the millions of tourists who visit this forested paradise every year, Big Bear Lake offers world-class snowboarding, skiing, sledding, hiking, nature walks, mountain biking, boating, fishing, kayaking, sailing, water-skiing, wakeboarding, parasailing, golfing, shopping and entertainment for the whole family young and old who come to play in the snow. On the ski slopes you will find children as young as 2 & 3 years and seniors as old as 85 enjoying the outdoors together on either skis or a snowboard. You will see beginners trying to just make it down the beginner run and expert snowboarders who appear to defy gravity with their amazing high jumps, flips and spins. There are two major ski and snowboard resorts - namely: Bear Mountain and Snow Summit. They were both known as Big Bear Mountain Resorts and were owned by the same company, the "Snow Summit Ski Corporation". Late 2014, Mammoth Mountain Resorts bought both companies and later sold both to the Alterra Mountain Company. There are numerous Ski and Snowboard Shops that offer ski and snowboard rentals. They also sell skis, snowboards, boots and the latest styles in snowboard gear, clothing, hats, and accessories. Wintertime in Big Bear isn't just for skiing and snowboarding - visitors enjoy walking and picnicking by the lake; a word of caution though - please stay off the ice as this can be dangerous. The Discovery Center on the North Shore is open as well as the Big Bear Alpine Zoo. Shopping in Big Bear Lake is surprisingly good, there are several small markets as well as Vons Supermarket and Stater Bros Supermarket. The town has a large K-Mart / Sears store and several pharmacies, namely: Walgreens, CVS and Medical Arts Pharmacy. The Big Bear Lake Village is a must see, there are numerous shops and great places to eat. Summertime in Big Bear Village. For your dining pleasure the Village Restaurants offer casual to fine dining, your choice of Mexican, Italian, American, and Indian food. For your sweet tooth there are Ice Cream stores, Fudge stores, Candy stores and Coffee shops. You can spend all day exploring the Village Shops which offer trendy clothing stores, furniture stores, souvenir stores, fine china stores, western stores, art galleries, jewelery stores, T-shirt stores, just to name a few. The Village Theater on Pine Knot has four screens and shows first-run movies. Also located in the Village are four night spots - The Cave with live entertainment, AV Nightclub, Murrays, Club Bombay, Nottingham's, and Whiskey Dave's. On the corner of Pine Knot and Village Drive you can take the family on one of the Horse and Carriage rides around the Village. Every year the Village is the setting for the Classic Car Show, which attracts crowds of onlookers and participants from all over. There are usually events throughout the summer including the popular Village Wine Walks. Big Bear Lake receives millions of visitors and there are many first-class Lodges, Hotels and B&B's to accommodate them. For guests that prefer private homes and for large family groups there are an assortment of Vacation Rentals that range from the small one-bedroom Rental Cabins, luxury Cabins and large Luxury homes. (Check the Hotel/Lodge Section and the Vacation Rentals Section in this website). Other tourist attractions are the Alpine Slide at Magic Mountain which has a water slide in the summer and an inner tube slide in the winter. There is another inner tube slide in Big Bear City, east of Stanfield Cut-off. The Big Bear Alpine Zoo, located in Moonridge is a fun place to visit and is one of the few zoos in the U.S. that has a Grizzly Bear exhibit. Most of the animals are native animals that have been rescued. The Big Bear Valley Historical Society Museum is open during the summer months and offers an insight into the history of the area (see the History Section in this website). The Bear Mountain Golf Course is open during the summer months. It is a 9-hole course and is located opposite the Bear Mountain Resort in Moonridge. Annual Events include the the Amgen Tour of California, the Rotary July 4th Fireworks display on the lake, the Big Bear Lake International Film Festival, The Big Bear Horro-Fi Film Festival, the Big Bear Cowboy Gathering, the Old Miners Days, the Fawnskin Festival, the Doo Dah Parade, Art on the Lake, Mom's & Rods, the Classic Car Show, the Antique Wooden Boat Show, the Big Bear Pirate Faire at Pedersen's Mill in Fawnskin, the October Troutfest fishing contest, and the annual Big Bear Oktoberfest in September and October. The Big Bear Lake Performing Arts Center has a variety of live stage shows and theater productions throughout the year. On October 31, the annual Halloween celebration is held in the Village. The local shop-owners don their Halloween costumes and hand out candy and goodies to the hundreds of little ghouls and goblins. On November 28, the Village holds a celebration to welcome Santa's grand entrance and the Christmas Tree lighting on the corner of Village Drive and Pine Knot. Camping is very popular during the summer months. The Campgrounds in the area are the Serrano Campground, Pine Knot Campground, Hanna Flat Campground, Holcomb Valley Campground and Pine Flat Campground. There are also several Yellow Post sites (refer to our Camping Section in the Activities). Hiking is one of the most popular activities in the Big Bear Valley - check out the Hiking Section in Activities menu in this website. The lake in Big Bear Lake is eight miles long and approximately one mile across at its widest point. It has about 23 miles of shoreline and is located at an elevation of 6,743.20 feet. The present dam, built in 1912, replaced the original dam, which was built in 1884. The new dam impounds more than 73,000 acre-feet of water with a height of 72'4". The Lake is not a source of water for the local water supply. The only water taken locally is by the two ski resorts for making artificial snow. They may each purchase up to 500-acre ft. per ski season. The Municipal Water District manages the lake. Private homes, several marinas, public parks and some hotels, lodges and restaurants surround the south side of the lake. The lake is used for all kinds of boating including powerboats, (2-stroke motors are allowed), jet-skis, sailboats, row-boats, kayaks, canoes and Hobie-cats. Other activities are water-skiing, wakeboarding and wake skating. Meadow Park offers a swim beach in the summer as well as playing fields and tennis courts. The Miss Liberty Paddle Wheel Boat offers tours of the lake all year round. It is enclosed with glass windows so you can stay warm in cold months. The Big Bear Pirate Ship operates fun lake tours during the summer months, the boat is the Pirate boat used in the movie "The Time Bandit". Located near the Dam on Government lease land is a historic area dotted with picturesque older cabins, built among the boulders and tall pines. In the same area you will see Treasure Island, sometimes called China Island,( the correct name is Garstin Island). Treasure Island is privately owned and the home is built on top of the giant boulders is a series of wonderful Oriental style buildings that were built in 1911 by Maude Garstin. The nearby boulders are a favorite with tourists and local youngsters for jumping and diving. The Lake is a favorite with boating enthusiasts, and during the summer season, tourists and locals take advantage of the picturesque surroundings to enjoy fishing, wakeboarding, water skiing, jet skiing, parasailing, sailing, canoeing, kayaking and swimming. In the winter months, the Lake sometimes freezes over, and although it is beautiful to look at, it is dangerous and the public is prohibited from playing on the ice. 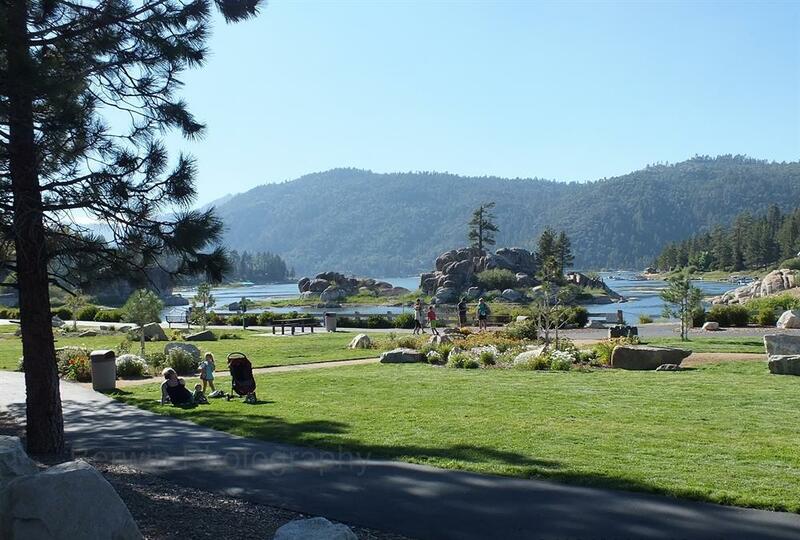 The newer Boulder Bay Park on the west end of the lake has become a popular area for visitors to play by the water, fish, kayak, canoe and picnic. The Big Bear Valley consists of Big Bear Lake (south shore of the lake), Fawnskin (north shore of the lake), Big Bear City (east of the lake), Sugarloaf, Erwin Lake, Baldwin Lake and Lake William. For more information, refer to the Maps Section in this website - Bigbearlake.net.